Elegance is what matters when it comes to accessories. By elegance, it means that bringing out a prominent on your face so that the accessory, like earrings, can be noticeable. 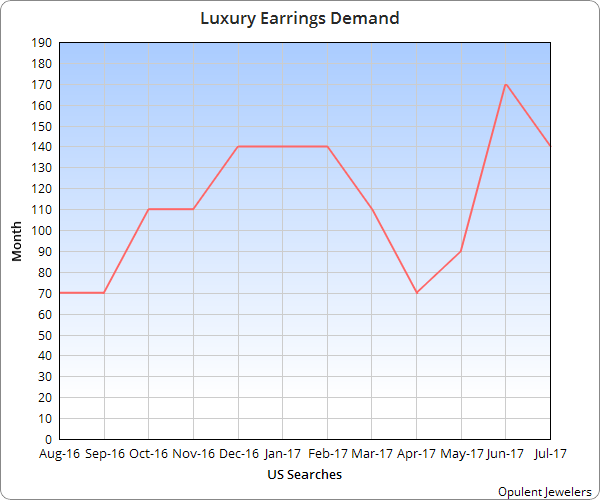 Admittedly, the trend of wearing luxurious earrings is not stable. Still, women believe that it’s better to wear a more elegant earring than any other kind of accessories. Starting from April 2017, the demand of wearing one is starting to increase. Versace is a known brand ever since the late 1970s when it comes to fashion. Their range of product consists of stylish clothing and accessories. Their line of luxurious earrings has never failed to be mentioned among the top earring trends of any year. The Chain Medusa Logo Earrings, in particular, have been crafted in Italy. They have gold metal chains in the middle of press stud fastenings and embellishments. The embellishments have a logo of Medusa on it. The asymmetrical gems formed into a pair of earrings are one of the latest fashion trends when it comes to earrings. They appear to be the classiest among all. This product from Racil has a silver-tone in it, which adds pure elegance to the accessory, making it look very clean. The asymmetrical jewels can be removed if you wish to wear only the main earrings. In which case, they will look like a seven-pointed silver sun. Alexis Bittar is not just a famous jeweler name; it’s also a brand that has sparked the interest of many women when it comes to earrings. This time, Bittar has released a chunky hoop luxury earring for sale. The hoops are made of 10 karat gold and have a warm gray color. They also have a gold fastener, which is just as noticeable as the hoops. To those who wish to look simpler but want to stay classy while wearing a luxury earring, this product from Charlotte Chesnais is what you need. It’s a pretty yellow gold earring crafted to look like a golden rose petal. It also has vermeil sterling silver attached to it. The silver fits the yellow gold color of the petal. The earrings also have a post back closure. These barbell-shaped earrings look elegant. The sphere on both ends are made of gold and are used to fasten the accessories securely on your ears. On top of the fastener, you can see small golden plates. These are followed by a silver bar which leads to the bottom gold sphere. Keep in mind that these earrings are just some of the trendiest ones in the market. A lot of fashionable women love these earrings. So what are you waiting for? Be sure to get one of these earrings while you can. Separator image Posted in Accessories.